Above, Jerry’s Style-Up: Before and After. Meet Jerry — in his own words. The cartoons are mine. 1. Describe your style, in general. Is “Jewish Nerd Dad Chic” a thing? I wear lots of t-shirts with logos and/or imagery, usually design, software or pop culture-related. I also own a number of fine vintage silk shirts and florals. 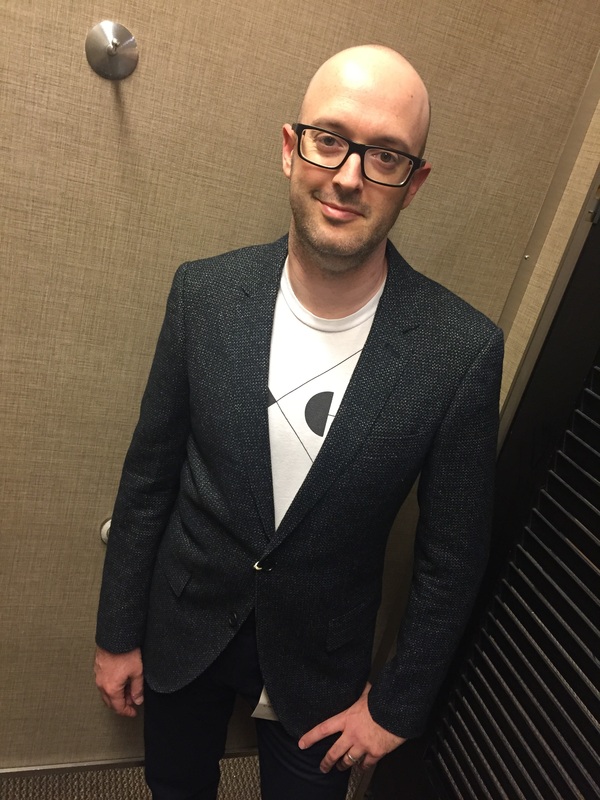 I rarely wear a suit and tie into business meetings, as I’m expected to represent the “creative” element — “business casual” shirts and pullover sweaters are de rigueur. Nice jeans or corduroys during the week, cargo shorts on the weekends. Also, a hat or head covering is typical — a knit skullcap for business, a driving cap otherwise. 2. Tell the story about why you decided to do a Style Up? 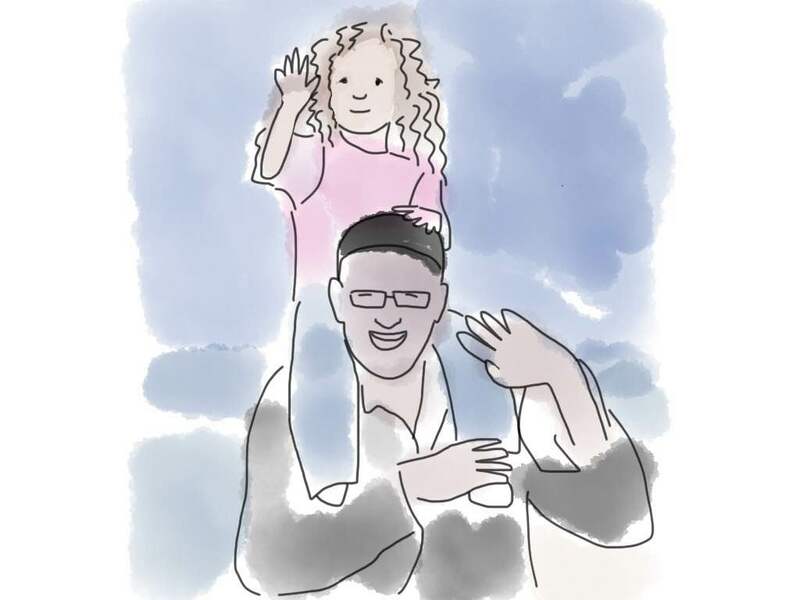 I don’t dislike my current day-to-day style, but as a busy father of three, I don’t frequently refresh or reconsider it — and I occasionally wait too long between refreshes. My business wear aesthetic could use a dash of sophistication. 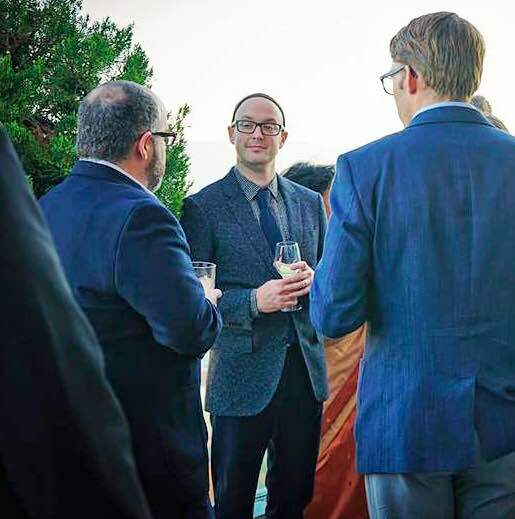 Then, I was peer-nominated for a very prestigious award at my company, wherein I was invited to an exclusive banquet with the CEO, CFO and other Senior Operations staff. I recently moved to Silicon Valley and had this one moment to make the best possible impression on the top brass. I wanted to project effortless refinement and a fashion forward sensibility without pretension or overstatement. My existing “dressy casual” lineup wasn’t particularly reflective of my personality. 3. What did you learn from the Style Up? 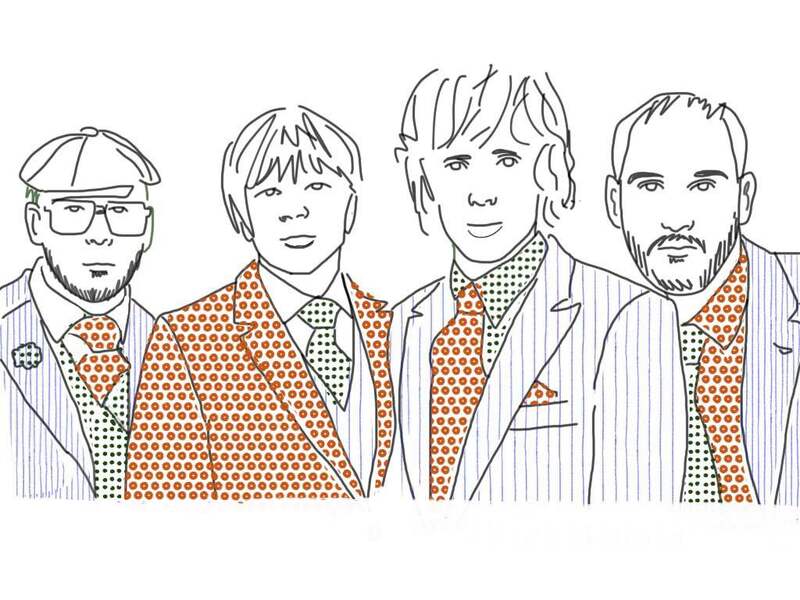 So as not to leave anyone out, I’m including all four natty members of OK Go. entire process, and I realized that getting the salespeople on your side is helpful to achieving the best results. 4. If you could channel the Style Traits of any personality, who would it be? Either of the front men of OK Go — Damian Kulash or Tim Norwind. Those guys personify excellence and innovation across music, visual media, performance and conceptual art — all with rakish good looks and impeccable style. Jerry takes his new outfit for a test drive. The photos Jerry showed me of last year’s award banquet attendees featured well-dressed men and women in suits and dresses. Because of the short turnaround, however, anything we bought had to fit off the rack. No tailoring or altering would be possible. This ruled out a suit, which could require multiple trips to a tailor. When learning any skill set, people discover that a) what they thought was simple is actually complicated. Then, with time, learn that b) what is complicated can be made simple through a series of steps. In Jerry’s case, we had a few hours to nail a single outfit. And we had access to the entire downtown San Francisco area, with dozens of stores. Too many options. That’s why we started with the shoes. Not only does an outfit begin with your feet, but also, it would help Jerry and I articulate what kind of aesthetic suited him best for the occasion. Jerry and I looked at six types of shoes at Nordstrom, each representing a different “style platform.” In each category, we pulled from the shelf only the best model; it needed to be eye-catching without being ostentatious. 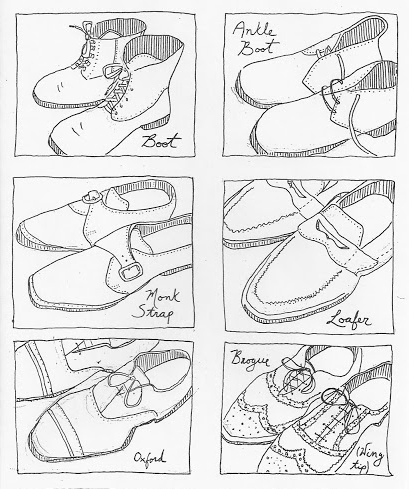 Oxfords were “too plain,” and everything else was too casual for this critical evening; Jerry selected the brogues. One watershed choice remained: Nordstrom sells a great line of brogues from Allen Edmonds in a few different colors. If Jerry chose brown, that would send us looking for an outfit featuring brown, blue, grey, and red: stylish but casual. If Jerry chose black, it might indicate that he was looking for a more restrained, formal look. Jerry’s final choice, however, was a bit of a style-swerve: Blue leather, red laces. Allen Edmonds hit on something amazing with this particular shoe, the Neumok. 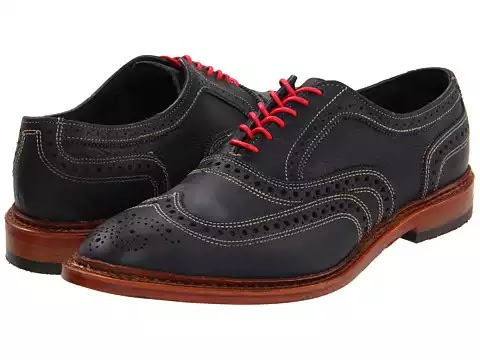 While the wingtip stitching affords it plenty of flair, the shoe’s basic style is such a classic, it can easily contain the eye-catching colors without suffering any loss of elegance. (For a deeper dive on achieving that balance, click here). Now, we knew: we were going for a look with attitude. Simply a placeholder for an even better outfit. When I was a teenager, I was fascinated by the idea of a “working title.” The Beatles, for example, used “Badfinger Boogie” as a working title for a new piece which, eventually, they named “With a Little Help From My Friends.” It’s hard to imagine that such a familiar, classic, and, well, perfect song ever had a different name…or no name… but all great things go through iterations, and placeholders are needed to mark progress. Since we were already in Nordstrom, we began to look through the racks to see what caught our eye. Only one shirt stood out from the endless racks of button-down shirts, and not surprisingly, it was gingham. Gingham is an amazing pattern because it can be dressed up (I love wearing gingham with a suit) or it can be dressed down (jeans and canvas sneakers or Clark’s desert boots). Meanwhile, it “builds structure” — the vertical lines build height and the horizontal lines broaden shoulders and give the arms definition. 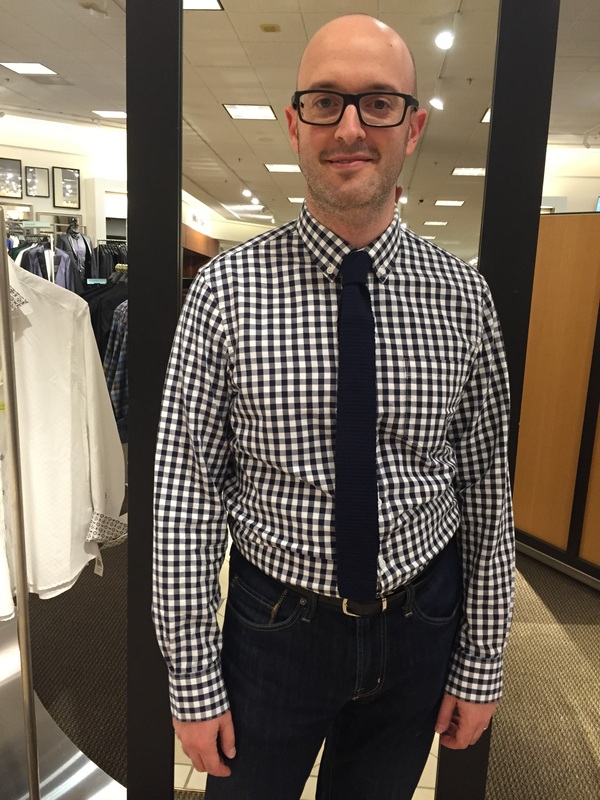 We paired the gingham shirt with one of my favorite go-to ties: navy blue knit. 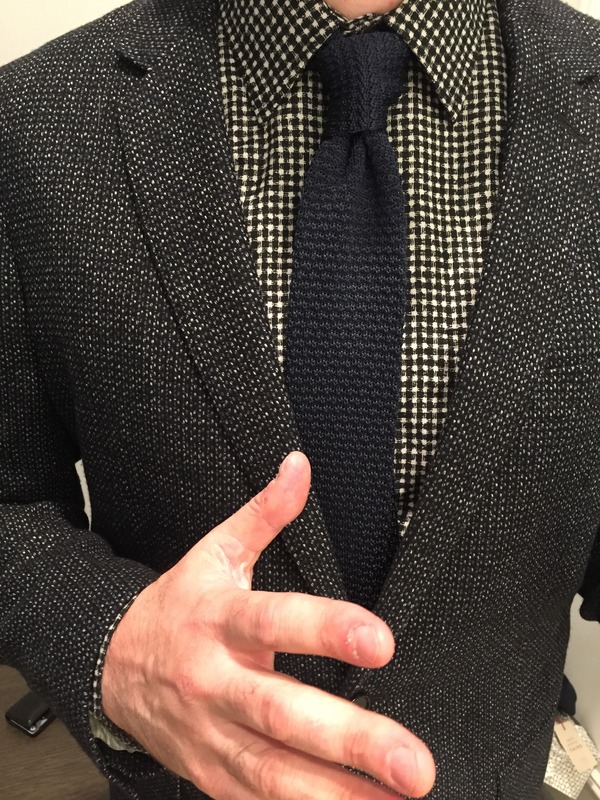 Like gingham, a knit tie dresses up an outfit, and yet, it retains a casual edge. It stands out, subtly, from crowds of shiny silk ties. On the other hand, the shirt wasn’t tailored as sharply as I wished, and the tie was a bit underwhelming in its quality. Don’t get me wrong, the outfit would have looked great in almost any workplace, and maybe even for Jerry’s award ceremony, but I felt like we could do better. Notice the same gingham from above, but in a finer size, a more formal color, and paired with a killer blazer. From there, we headed to Club Monaco, a great Canadian label, featuring premium gear and excellent service. The store we visited was full of rugged but refined sweaters, chinos in rich, blue fabric, a handful of shirts featuring variations on classic themes, and blazers that catch the eye with their understated elegance. It was not cheap, but you could clearly see what your money was getting you. One of these blazers caught our eye within a minute of walking in the door, and soon, we found a gingham shirt that picked up the general approach of our “working plan” above, but in a dark, charcoal hue, and featuring a smaller print (generally, smaller prints are more formal than larger prints, even in the same category). Lastly, a knit tie – like the tie from Nordstrom, but in a darker blue, and featuring pleasing, slightly irregular weave, a hallmark of handwoven cloth (vs. too-perfect mass-produced). This new ensemble, layering dark navy and charcoal, allowed us to assemble an outfit resplendent with texture. While other award attendees might wear an obscenely expensive Italian suit or eye-catching patterns or ostentatious detailing, Jerry’s new outfit was captivating in its subtlety. It wasn’t trying very hard to be awesome. It WAS awesome. An unstructured blazer can be paired with a t-shirt for casual Friday. Ready for your own Style-Up? I won’t hold your hand, but I will guard the fitting room door. Live in the bay area? A Style-up is painless. Maybe even fun. And it might help you land a date / job / both at the same time. Email Me and we’ll get you on your way! Outside of the Bay Area? An On-line consultation will provide you with a handful of great items, some new looks, and a spring in your step. Click to Email Me. Want to See More Style-Stories? and Paul’s Style Story (Rugged and Refined) here!